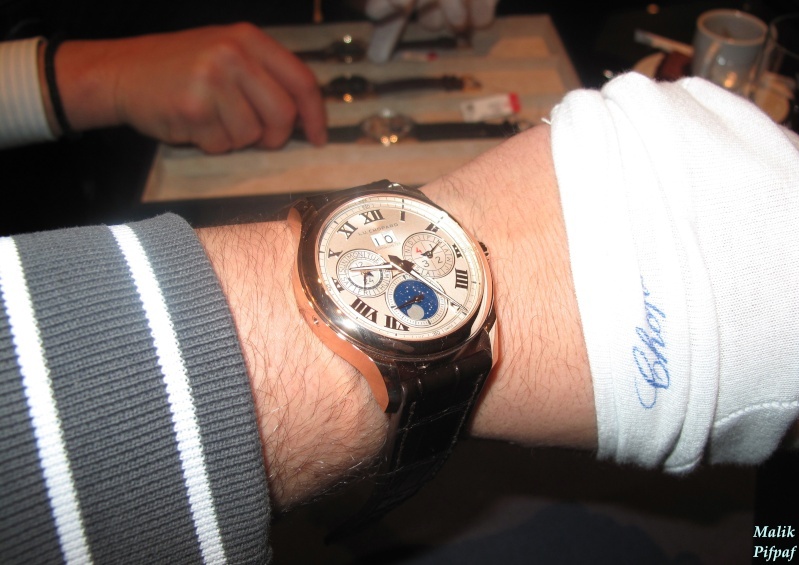 When you write during Baselworld 2012, you don't have time for reading, and you sometimes have some very good surprises when you discover some watches, as it was the case on Chopard's booth. 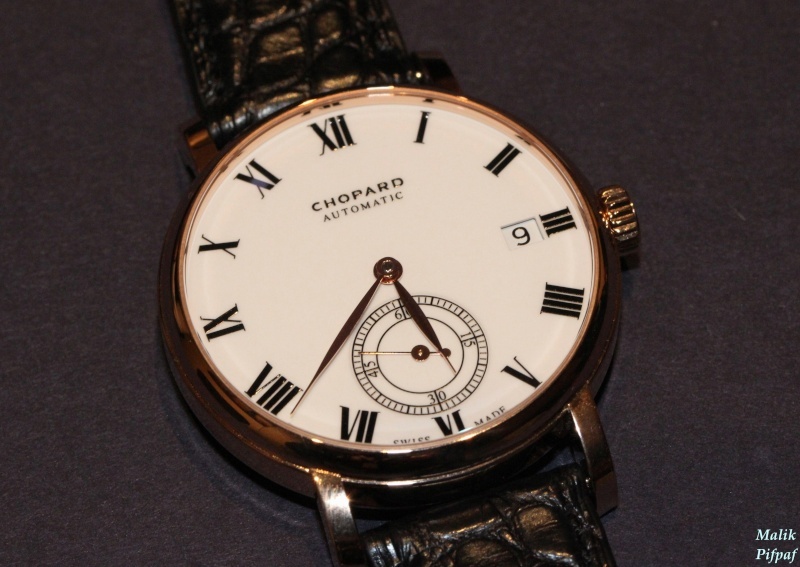 Unexpectedly, Chopard achieves an excellent show in a globally dull Baselworld 2012. As our most loyal readers certainly know, we have been positively impressed by the Chopard Engine One Tourbillon fitted with the caliber L.U.C 1TRM. This watch was an aesthetic and technical success, because it was entirely built around its movement. However, it had the flaw of its qualities: its price. A tourbillon is expensive, and very few amongst us could pretend to be able to afford the watch. 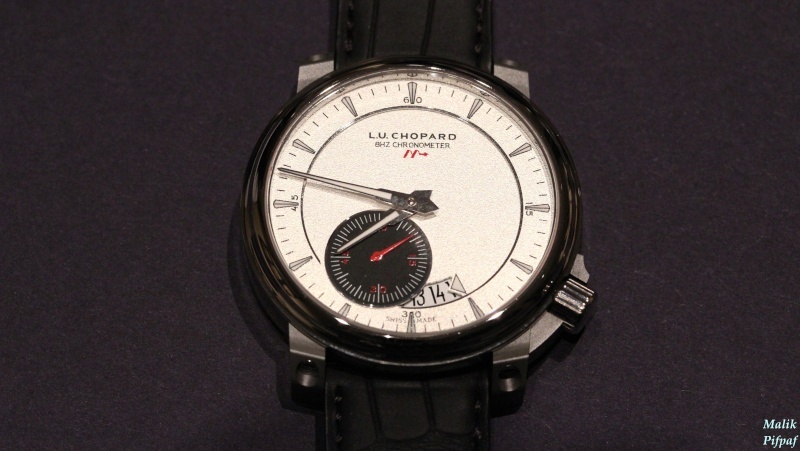 So, we hoped that Chopard would reinterpret the L.U.C Engine One's spirit into a more affordable price range. It is now done, with the LUC 8HF. The "HF" is not a reference to the Lancia Delta Integrale. Here, "HF" stands for "High Frequency", and the "8" is a remainder of the 8Hz frequency. But the watch probably borrows some of the spirit of the famous rally car, even if unconsciously. It features angular and virile shapes, innovations and high performances, all of these actually fitted into a rather compact watch, actually. 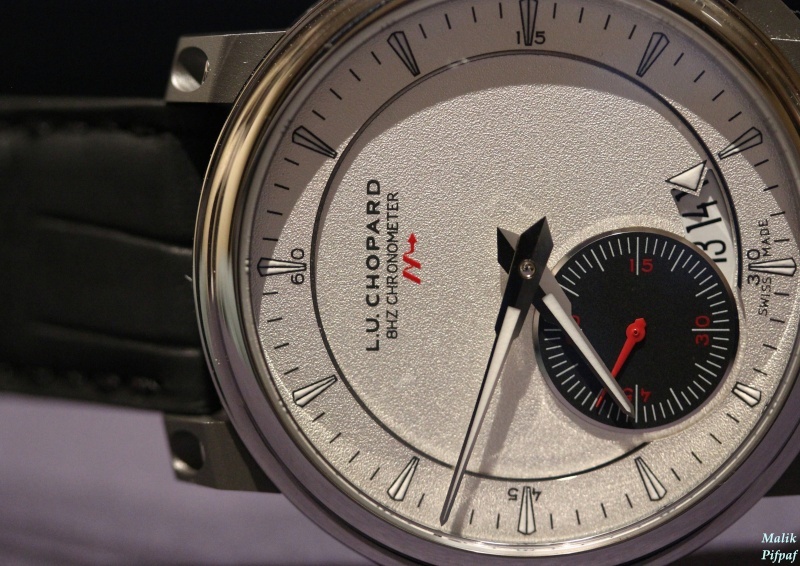 In fact, it is almost surprising that, despite all the connections established between the brand and the automotive field, Chopard did not build the 8HF's storytelling around this theme. The main interest in this piece, is of course the technical solutions which make this 8Hz frequency achievable. Most of the attempts at high frequencies usually remain in the realm of prototyping. With these very expensive watches, produced in extremely limited edition, one remains in a research laboratory , where calibers are especially and only developed to reach the high frequencies. 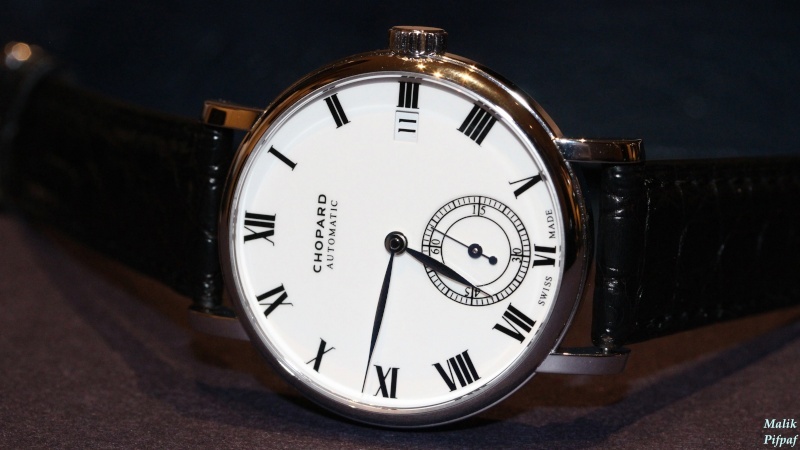 Chopard took the absolute opposite line, by choosing a slightly modified LUC caliber as a basis, in order to produce a less exclusive watch, very quickly. 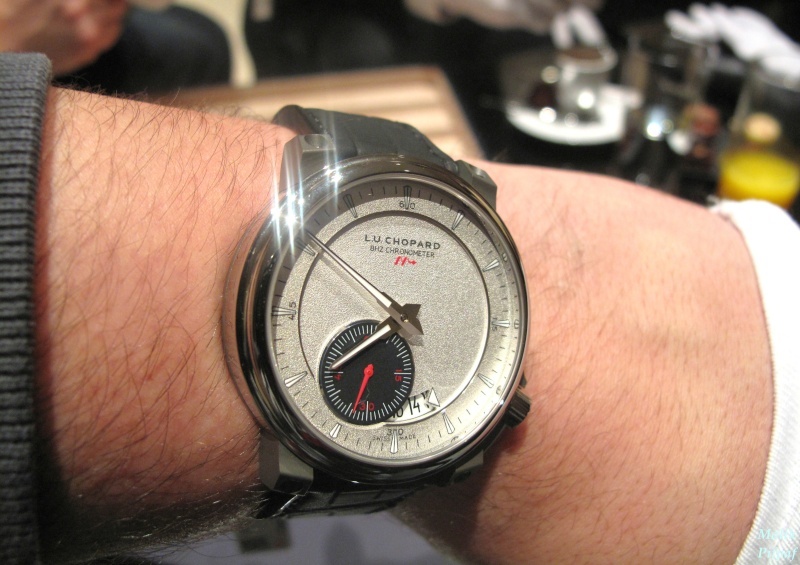 Hence, the only difference with the classic Caliber LUC 4Hz is the escapement device. The impulse peg and the escapement wheel are made of silicon, while the balance wheel and the spiral remains in traditional materials, even if they are adapted to the high frequencies. In fact, the original barrel remains the same and features the same power reserve, in spite of the doubled frequency (theoretically, when one drives twice as fast, the gas tank empties accordingly). How? Namely, all the optimization work focused on the escapement wheel and the anchor. The latter moves with a far reduced amplitude than that of a caliber set at 4Hz. As a result, this stage uses less energy. The specific shape of the regulating parts and the silicon's physical properties complete the job. 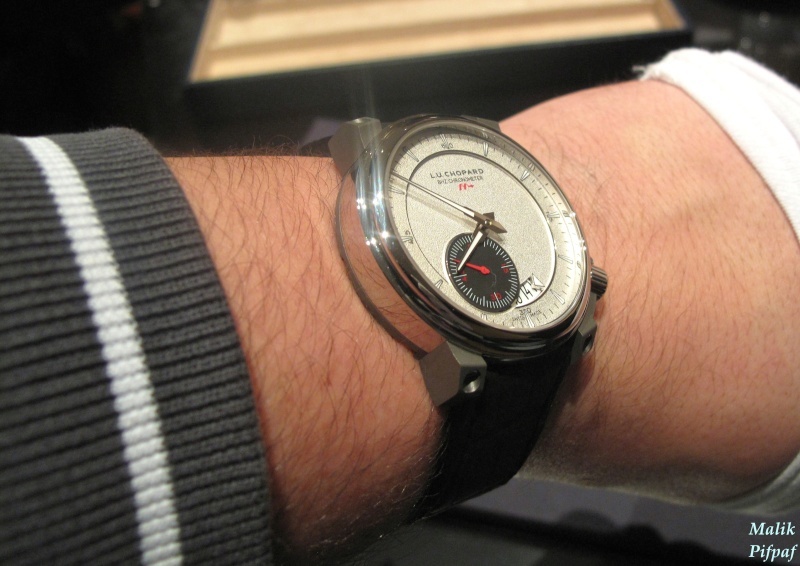 The dial is also much contrasted: it is made of grained silver, and features a red small "large second hand", on a black sub-dial. It is a wise choice, as it gives way to the flowing of time, at a rate of 8 leaps per second. Just as the dial, the casing is a lucky mix between modernism and tradition. Both parts of the 42mm case are made of titanium, with a waterproofing up to 100m; it’s very coherent with the sport design of the case. The casing's upper part features a very traditional polished titanium finish, in contrast with the highly technical finish (by plasma thermal spraying) of the black shot-peened case back. While the overall design is very convincing, the case back is a bit surprising, with the little aperture on the escapement block, through a sapphire glass. So, akin to the Engine One Tourbillon, the song matches the plumage: the union between futurism and traditionalism in the caliber, shows on the watch's exterior. This piece is available for less than 15,000€, which is a reasonable price, if one takes into account the movement’s imbedded technology; featuring a COSC certification, which is a first for a caliber set at more than 36000v/h, ( 57,600v/h for 8HF) ; it demonstrates that the brand trusts its product. 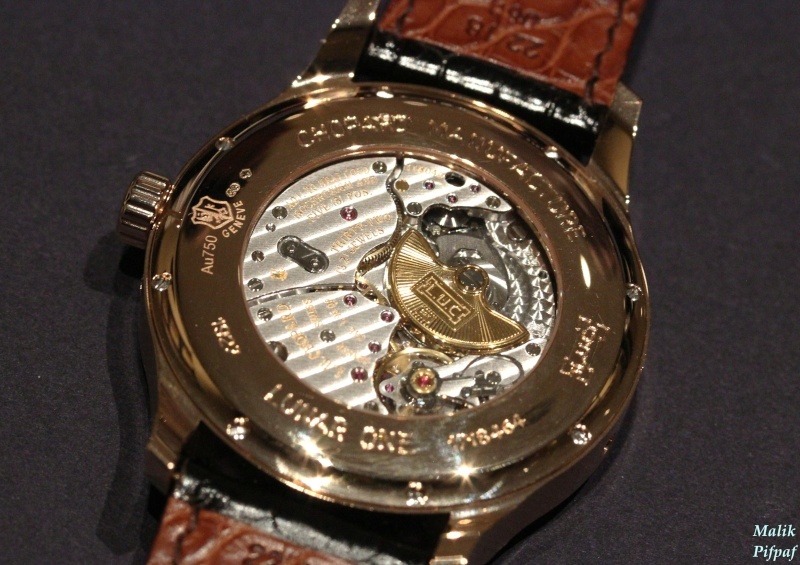 The LUC calibers are also popularized by the “Manufacture”. Presented this year, this gold watch features a new generation of calibers, intended to replace the ETA movements. 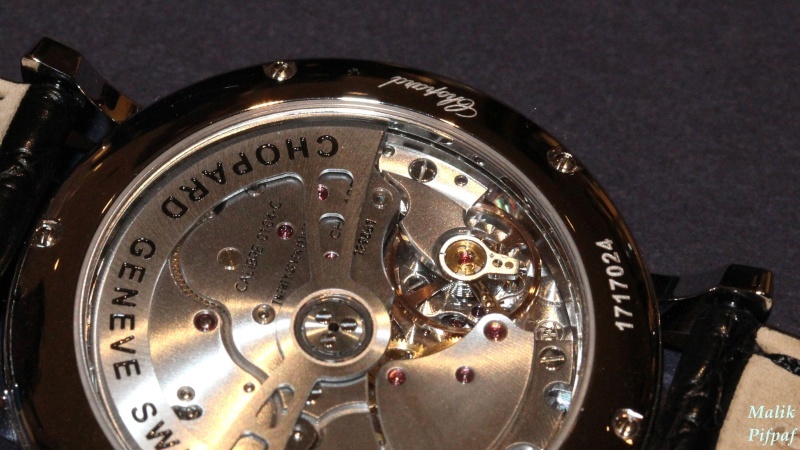 In order to face the expected shortage of Swatch Group calibers, Chopard entirely internalized its production. This will be a delight for the future buyers of Mille Miglia and other series, which were previously powered by Valjoux calibers. In terms of architecture, the new Chopard 01-04-C is very close to the LUC 01-01-L ; It is set at 28,800v/h, with a 60-hour power reserve. The movement measures 28.80mm by 4.95mm.The Chopard 01-04-C reuses more or less the LUC 01-01-L's layout, but without the handmade finishes and with 4 jewels less. The LUC's beautiful decorations are replaced by a very industrial brushing (which reminds us of the P9000 from Panerai); it is very convincing, and at any rate, far superior to the best finishes proposed by ETA. When the Citroen DS was presented in 1955, the engineers from the Quai Javel had already a cheaper version of this high end model in mind: the ID19. While this economical model sacrificed some of the DS' luxury features, it still featured the cutting edge technologies and the outstanding handling qualities of the brand's flagship. The “Classic Manufacture” is available in three colors of gold, with a 38mm case with a very convincing streamlined design. 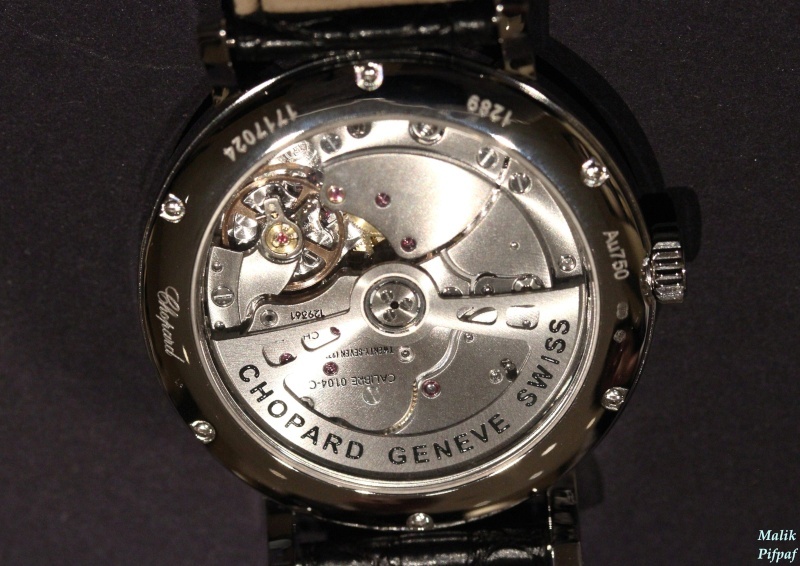 It is almost a start from a blank slate, as the design is so different from Chopard's style. The dial is lacquered in white, with painted roman numerals. This minimalism is appropriate, since it highlights the caliber and the transition initiated with this new range of movements. 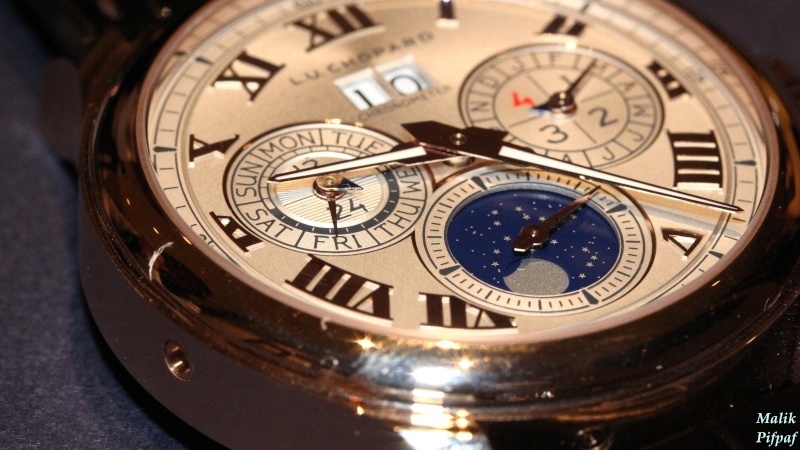 Finally, we discovered the L.U.C Lunar One, a new version of Chopard's perpetual calendar. While the previous pieces spawned from a will to popularize the calibers and technologies of the brand , the Lunar One is a demonstration of the Chopard manufactory's know-how. With a diameter of 43mm, a waterproofing up to 50m (hence, it is Jump-into-the-swimming-pool-fully-dressed-proof) and its XL sub-dials, it is a dressy watch, but not too much. Even though it looks classic , it preserves a casual and pleasant side, and allows the watch to be worn with most of the outfits. The rose gold case enhances the classic flair of the watch; the white gold reinforces the sporty side, which is appropriate for a positioning on the sport-chic QP market, a rather marginal sector. One could think of examples such as the pleasant deMonaco QP or some De Bethune, but the sport-chic combined with the QP, unfortunately remains a niche. One has to say that, with the variations of the light (it must be even noticeable with the sun light), the dial looks less ornate than on the photos. For that matter, the large "orbital" moon phase (which means that the disk revolves around its axis) is quite visible in the dial, thanks the contrasted colors. several QP's indicators, despite their large fonts. The caliber is a LUC96-13L aka QP, an automatic 33mm movement, set at 28,800v/h; it features a 70-hour power reserve, provided by two barrels. Like all the QP caliber on the market, it is modular. 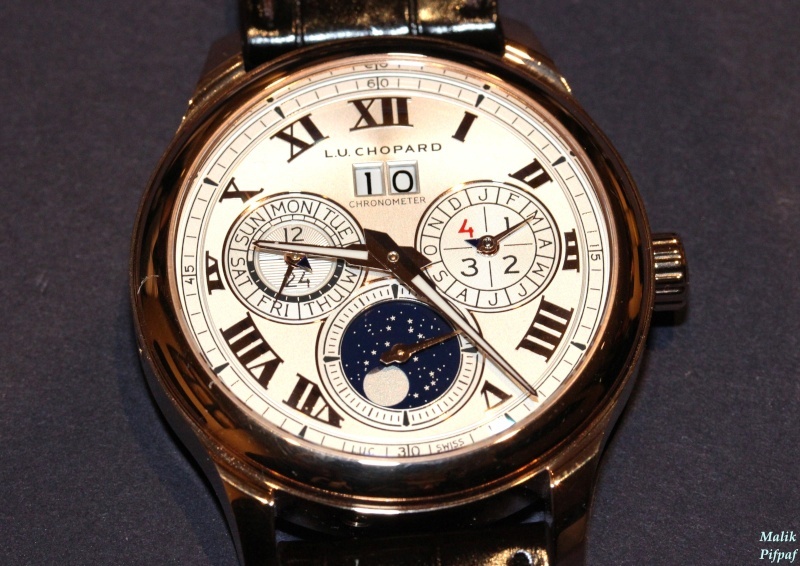 The complication plate is nonetheless one of the most complex available nowadays, especially because of its "Grande date" and of its moon phase with a small time lag (one day every 122 years). 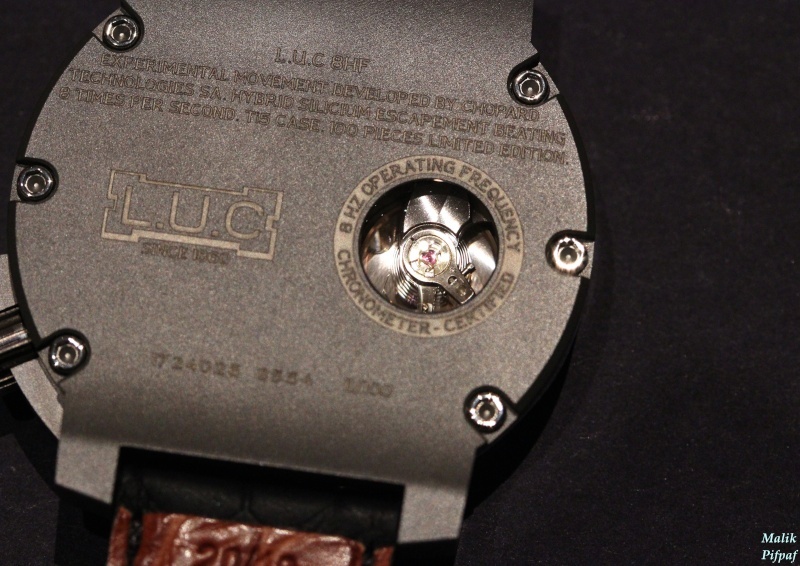 And of course, the “L.U.C” finishes convey an undeniable charm, which reinforces the attractiveness of this watch. The new Lunar One features 2 certifications: The "Poinçon de Genève" based on the new standard, and the COSC, which is quite rare for a QP. In a transition period, when the future of watchmaking is uncertain, Chopard successfully anticipates the end of the deliveries by the Swatch Group, but also prepares the future by being one of the first brands to propose silicon and very high frequencies for a "mass market" series. Finally, and it is maybe the most important point from a customer's standpoint, the aesthetics evolve toward something more actual. Post edited to comply with TimeZone Guidelines. Please do not post references to sites offering watch discussion.